Breakstone, White & Gluck, a longtime supporter of Bikes Not Bombs, was pleased to partner up with the organization again this year, by donating bicycle helmets to the Girls In Action Program. Attorney David White recently attended the graduation ceremony. 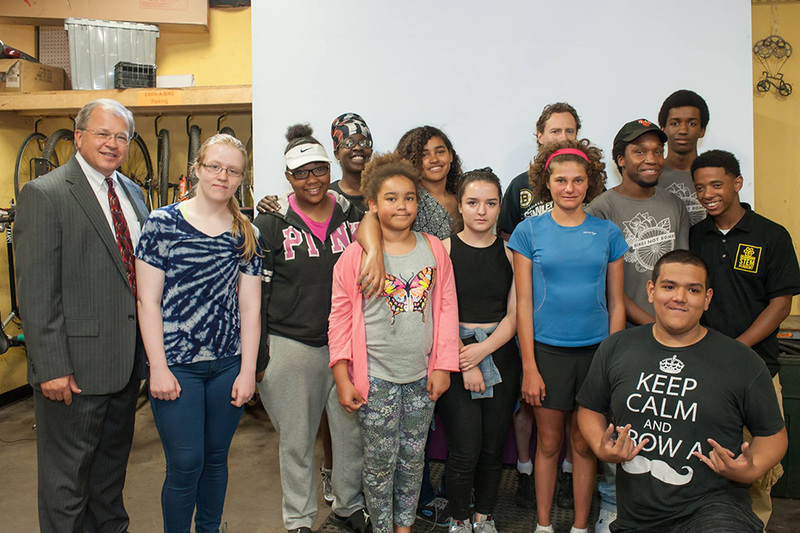 Bikes Not Bombs is based in Jamaica Plain and has two popular youth programs: Earn-A-Bike and Girls In Action. Both are terrific programs, which give children and teenagers a chance to learn bike repair, bike safety skills and make friends. At the beginning of class, the youth get to help select parts for a bike they will help build, eventually “earn” and get to take home. During the class, students are taught the rules of the road and to always wear a bicycle helmet. They get plenty of practice, taking group rides in the city. They are shown how to travel on bike lanes and navigate park and other areas. Earn-A-Bike is a co-ed program while Girls In Action is open to girls ages 12-18 and includes some field trips and activities outside the bike shop. One of the Girls In Action programs created a safety video a few years ago. The first topic was bicycle helmet safety and the importance of wearing one every time you ride. Watch. Bikes Not Bombs works locally and internationally, founded in 1984 as a response to the United States military backing of the Contra attacks on Nicaragua. 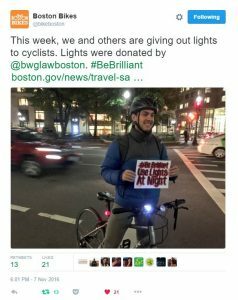 The organization believes in using the bicycle as a vehicle for social change and each year, collects roughly 6,000 used bicycles and tons of parts from supporters in Boston and New England. Some of the bicycles are used in its youth programming. But many bikes are sent to partner groups in other countries where a bicycle can increase access to economic opportunity, education, health care, and civic engagement. Bikes Not Bombs was founded in 1984 and has since shipped over 55,000 bicycles to partner groups in 14 countries in the Global South. The law firm of Breakstone, White & Gluck actively supports youth cycling safety in Massachusetts. Through our Project KidSafe campaign, Breakstone, White & Gluck has donated over 10,000 bicycle helmets to children who need one since 2013. If you are a cyclist, please remember to wear your bicycle helmet every time you ride. Here is a helpful video on how to properly fit your helmet. With a donation from Breakstone, White & Gluck, the Cambridge Police Department will distribute bicycle helmets to children who need one during National Bike Safety Month. Photo: Attorney Ronald Gluck and David White of Breakstone, White & Gluck gather with children at the Cambridgeport School, Assistant Principal Audrey M. Sturgis and Cambridge police officers Che Santos and Anthony Santiago. 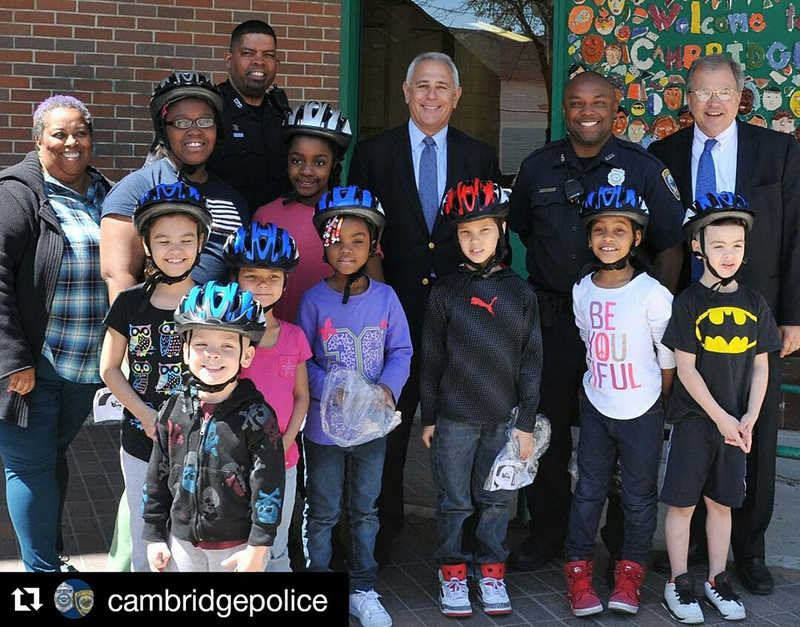 Breakstone, White & Gluck was pleased to donate children’s bicycle helmets to the Cambridge Police Department for National Bike Safety Month in May 2016. Cambridge Police has announced its first “helmet voucher” program as part of its National Bike Safety Month initiatives in May. Police officers will specifically be looking for children who are riding bicycles without a helmet throughout May and hand them a “helmet voucher,” which can be redeemed for a free bicycle helmet at the Cambridge Police Department. As part of our Project KidSafe campaign, Breakstone, White & Gluck recently supported the Boston Bikes’ Get Biking Challenge, a city-wide biking competition for children in the Boston Public Schools. Boston Bikes, which is part of the City of Boston, hosted this first-time event in May to celebrate National Bike Month. Students were challenged to ride their bicycles every day of the month and track how many minutes they rode. Boston Bikes had strong results. Eleven city schools accepted the challenge, which meant more than 3,500 students were invited to participate. Nearly 1,400 students rode their bikes in May. On average, students rode 12 days of the month. 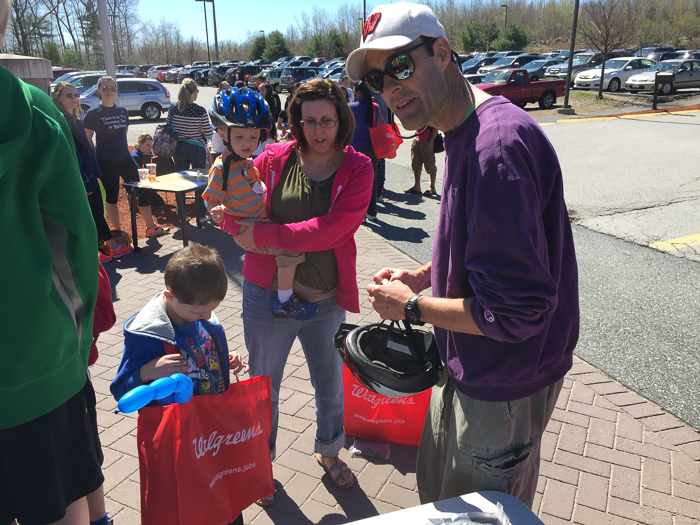 We had a great day in Westborough last weekend: Two fun community events, great weather and we handed out 160 free bicycle helmets to children. 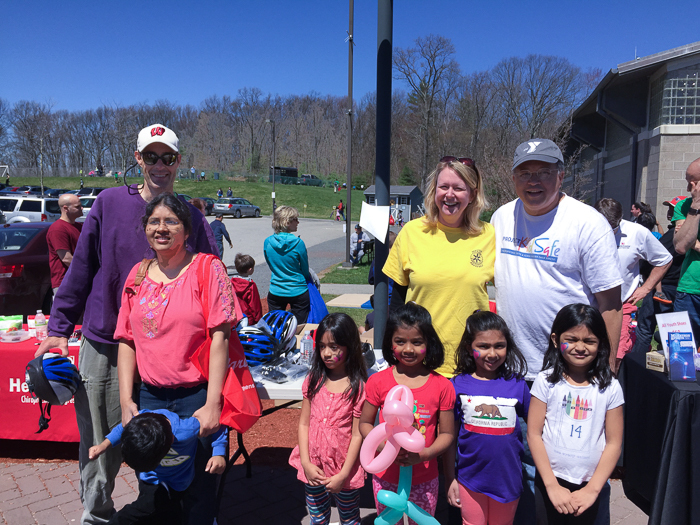 For this, we partnered up with the Westborough Bicycle and Pedestrian Advisory Committee and the Boroughs Family Branch of the YMCA of Central Massachusetts. Breakstone, White & Gluck donated the bicycle helmets as part of our Project KidSafe outreach. 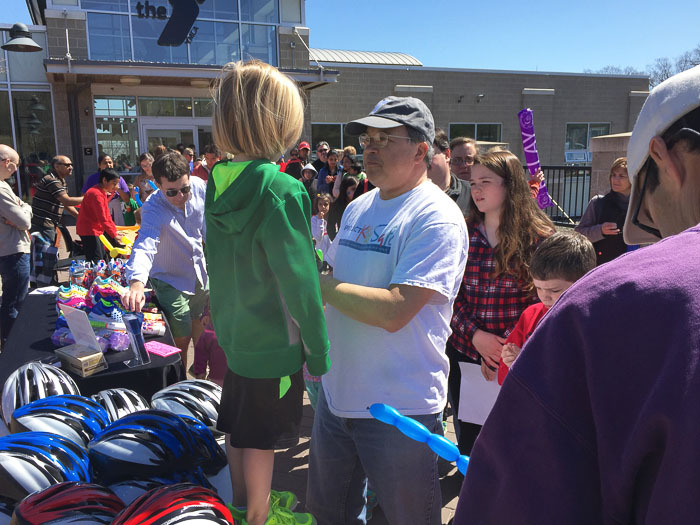 Attorney David W. White helped distribute the free helmets at Westborough’s Spring Festival, an event featuring just about everything which is hosted by the Rotary Club of Westborough. In addition to bicycle helmets, there was an amateur dog show, children’s carnival, road race, food vendors and the list goes on. 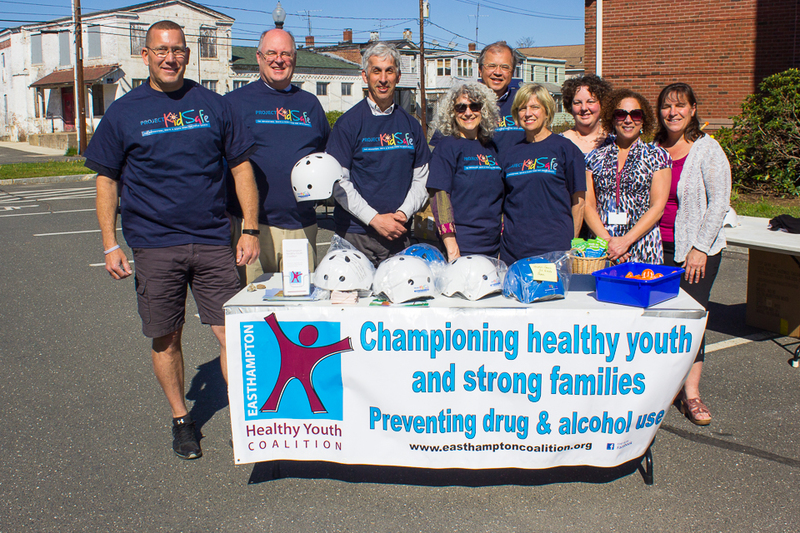 Attorney White and Bruce Tretter, chairman of the Westborough Bicycle and Pedestrian Advisory Committee, then went to hand out helmets at the Boroughs Family Branch of the YMCA of Central, which is nearby in Westborough. Breakstone, White & Gluck donated these bike helmets through our Project KidSafe initiative. We have donated over 3,500 helmets to children in Massachusetts since 2013. By year’s end, we expect to have donated 6,000 helmets. Read more about our Project KidSafe outreach or our bicycle safety tips. Photo: Attorney David W. White of Breakstone, White & Gluck helping a child at the Boroughs Family Branch of the YMCA of Central Massachusetts in Westborough. Photo: From left in back: Bruce Tretter, Chairman of the Westborough Bicycle and Pedestrian Advisory Committee; Betsy Moquin, Director of Marketing & Advancement of the Boroughs Family Branch of the YMCA of Central Massachusetts; and Attorney David W. White of Breakstone, White & Gluck. 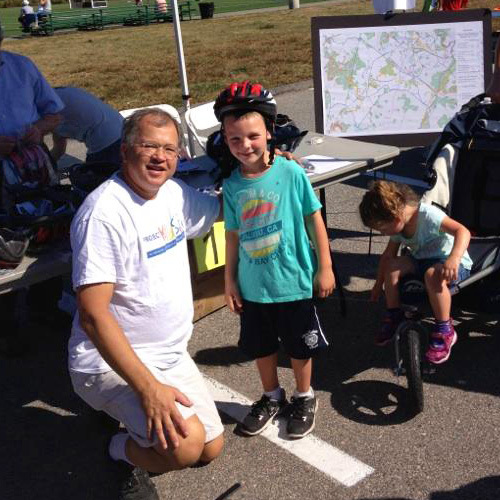 Photo: Bruce Tretter, Chairman of the Westborough Bicycle and Pedestrian Advisory Committee, helps a child find a helmet. 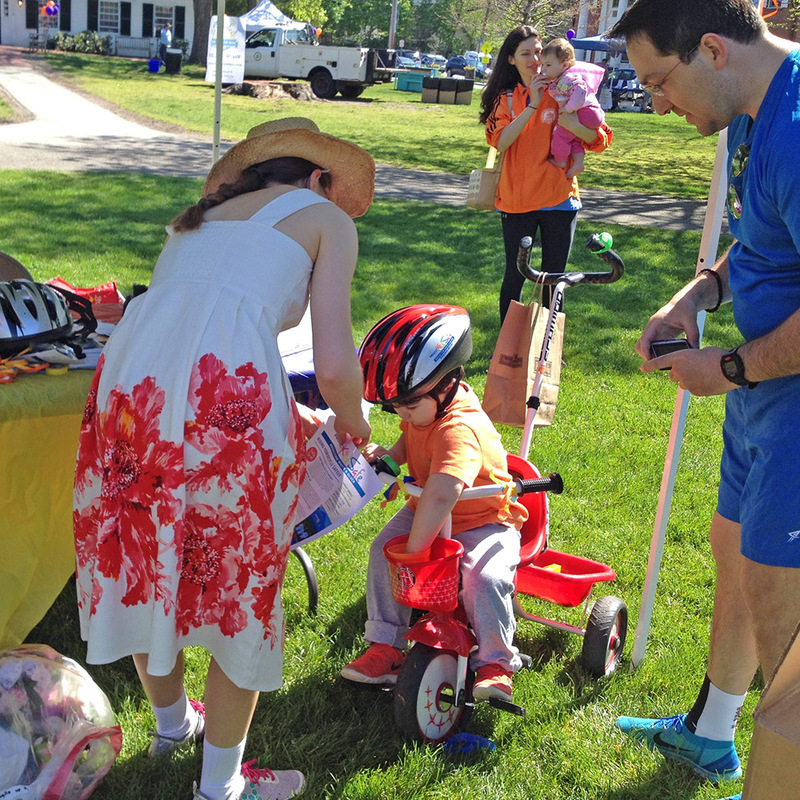 Westwood families received free bike helmets for their children and learned about cycling and pedestrian safety at Westwood Town Day on September 27th. The Westwood Pedestrian and Bicycle Safety Committee hosted an informational table at the town celebration which was held at the Westwood High School. Breakstone, White & Gluck donated 150 bike helmets which were distributed to children age 16 and younger. The helmets went quickly at the annual event, which offers a fireworks display, music, food and road races for adults and children over the course of two days. Committee members fit children for the bike helmets and explained the importance of always wearing them. Attorney David White, a Westwood resident and committee member, helped fit the helmets. 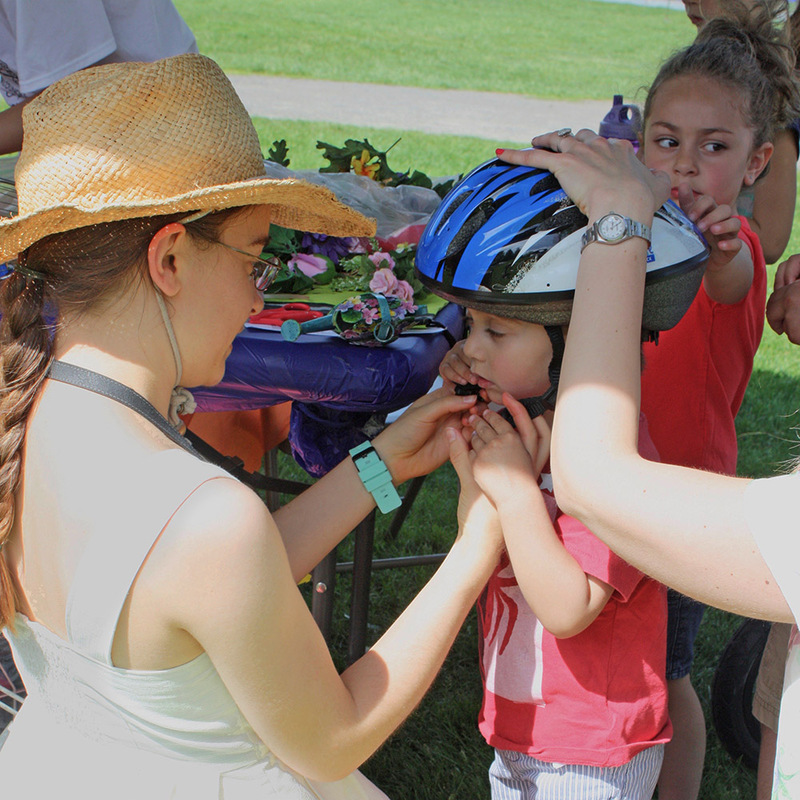 In Massachusetts, children age 16 and younger are required by law to wear bike helmets. Cyclists of all ages should wear helmets to protect themselves and reduce the risk of head and brain injuries. Many cyclists neglect to do this. In fact, less than half of all cyclists actually wear helmets, according to the Centers for Disease Control and Prevention. Breakstone, White & Gluck donated the helmets as part of Project KidSafe, our community service project to help prevent injuries among children. Our firm’s specialty is handling personal injury cases for those who have been injured, so we know firsthand the importance of injury prevention. We are devoted to keeping children safe. This is the second year we have donated bicycle helmets to organizations around the state. So far, we have donated over 2,000 helmets.